CELEBRATING 20 YEARS OF COMMUNITY! The Bay Area’s Premier Yoga Center is turning 20, and we’re excited to celebrate with our dedicated and diverse Yoga Tree tribe! We invite you to join us in expressing immense gratitude for the students, instructors, staff and spirit that have grown Yoga Tree into the source of inspiration we’re so proud to be considered today! It’s all because of you… and yoga. Let’s let the good times flow. 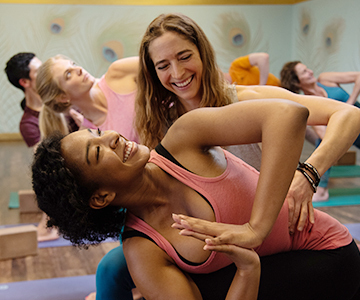 Stay tuned for stories, pop-up events, giveaways and other opportunities to fuel your soul and salute two decades of deeply rooted yoga tradition. Claim a spot in any of our high-quality yoga classes. We offer a selection of styles, levels and times to fit flexible schedules and diverse practices. Absorb the knowledge of our talented teachers in specialized workshops designed to deepen your relationship with yoga and yourself. Learn from the masters. Our teacher training program is a destination for exceptional yoga education led by globally-respected instructors.